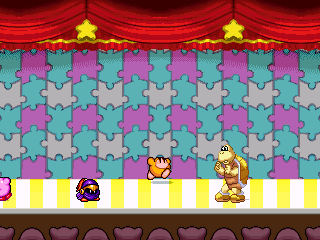 This is a modified version of the Kirby Super Star tutorial scene. I love the BGM, so I modified it for use as a stage. Using pixel editing & math, I separated the curtain shadow from the puzzle background into separate layers. I made the floor parallax and tried to make it as close to the regular one as possible.